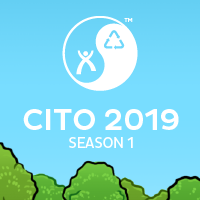 Come to CITO on April 11 at Kate Waygood park and receive a limited edition souvenir! SAGA is happy to announce first and only adventure lab caches in the province: Introduction to Saskatoon’s Public Art. Download Adventure lab app on your mobile or tablet device and find five lab caches at the River Landing in Saskatoon. SCAR2019 will be held on May 24/25 2019. It will be the 12th annual cache-and-release event in Saskatoon and area. Expect lots of new caches within 100 km radius around Saskatoon, 24 hours cache hunt and the final event at Floral Community Centre. Event will be published soon! And yes, there will be cool prizes - including an autographed Riders jersey! More info on that coming soon. That's right! It's our 12th Annual Christmas Party! Log your "WILL ATTEND" now! SAGA executive member DoryXplorey in collaboration with SAGA will host the Geocaching International Film Festival. Log your Will Attend now! This event is held with the co-operation of the Fairhaven Community Association and The Saskatoon and Area Geocaching Association to promote Geocaching in the Community and for new geocachers to come and learn how to start to geocache. SAGA member SmokinDeni will be hosting an event. Log your attendance NOW! The event within the event has been published. You do not want to miss it. Log your attendance NOW! Thinking of attending your first SCAR, come and meet some veterans to get the low-down on the event. Everyone is welcome to this event, even if you are not attending SCAR. Thank you to Schnor, the pancake breakfast will once again be happening. The event of the year has been published! We are already getting some great door prizes. Watch for the event to be published soon! The 11th Annual Potluck Party has been published. Join us for a Sunday Matinee! GIFF 2017 - Saskatoon has been published. Visit the cache page for all the details and log your Will Attend. SCAR X is this weekend! SAGA has partnered with Nature City Festival to assist with their Geocaching event. Nature City Festival - Geocaching!! SCAR X is published ! The ​10th Annual Christmas Potluck will be on December 3, 2016. The SAGA executive would like to extend thanks to everyone who participated in this year's SCAR event and helped to make it great! Remember that you can log the event cache as attended if you participated in any component of the weekend: hiding caches for the event, seeking caches during the allotted time period, or attending the barbecue! We are also looking for feedback about this year's/past year's SCARs to help us in planning for next year's event (which we anticipate will be at the end of May again). We hope to make the 10th Saskatoon Cache And Release event the best one yet! Visit the event page for details and to log your "Will Attend"
SCAR X - hard to believe its been 10 years of SCAR-- I think I was at every one but 2008-according to hurlyanne as she researched all the stats for the Legacy caches (and did an amazing job on them I must say). Thanks to Rina and Dallas (Sask_girl & Novy) for starting SCAR--it has become a tradition for Saskatchewan cachers and something everyone looks forward to every year! Thanks to all the prize donors, the list is on the SAGA website. Thank you to Connie (PrairiePedals) and Brian (McSpy) for taking on the task of buying and cooking the food for the barbecue-- well done and very tasty!!! Thanks to everyone who brought salads and desserts---there was a lot of food at this year's event!!!! Thanks to my fellow board members for without your volunteering and helping out this event would not take place!! And lastly, Thank you to each and everyone that took the time to hide caches for SCAR. With out the hides, we wouldn't have anything to find. With over 180 new geocaches placed for SCAR X-everyone should have plenty of choices for geocaching over the summer months!!! Cache on!!! See you on the trails!!! Thank you to pilot172 for a well organized CITO event which was held on April 16. We had many in attendance to make light of the work and to have a few laughs as well. Check the photo album for a few images from the day. We will be having another CITO in the fall so plan to be there! The SAGA executive would like to extend thanks to everyone who participated in this year's SCAR2016 event and helped to make it great! Remember that you can log the event cache as attended if you participated in any component of the weekend: hiding caches for the event, seeking caches during the allotted time period, or attending the barbecue! Saskatoon’s premier geocaching event is soon approaching! On May 27-28 we will be hosting a 24-hour geocaching marathon called Saskatoon Cache and Release, or SCAR. Every year local geocachers participate by hiding geocaches, finding geocaches, and attending the associated events. We finish off with a barbecue out at Floral School, which also includes prizes and a 50/50 draw. This year we are also planning some fun activities for children at the barbecue. Published!! Visit the event page to log your "Will Attend"
Event will be held on April 16, 2016. Watch for the Event to be published soon. come on out to Fuddruckers to celebrate π day on March 14, 2016. Watch for the official SAGA event to be published soon! 9th Annual SCAR will be held on May 27 and 28, 2016. Event details will be published soon. SCAR 2015 is officially on! June 19th-20th get your caches ready and get ready for 24 hours of fun, food and friendly competition. It's on and you will make it great this year. It's always been largely about the caches that are put out for everyone to find so keep it up guys! This year there are no restrictions on cache types but we are insisting that all caches be available to all cachers. That means NO premium member caches please. After the event feel free to change them but not till after thank you. Steak night fundraiser was a success!! Special thanks to prize donators Redmax & Belfastlass, Rider_Fans, Pawistik, Sask_girl and Sask_Travelbugs! Thanks to all who came out and supported SAGA your tickets help fund events like SCAR 2014, the Christmas Event and the re-issue of the much coveted 2007 Saskatchewan Geocoin. SAGA has adopted a section of Highway 16 east of Saskatoon. Look for our sign. We are responsible for cleaning the ditches along this section of highway twice a year. Watch for CITO events in the spring and fall. SCAR 2013 was another huge success! This year there were 257 caches hidden, 3 events, from what we can tell 174 people who took part in some way in the event! We want to thank everyone who helped make this event happen. Local cachers who either donated prizes or their time & skills are: bennykidd; GRDelainey; hurleyanne; Kris12345; pilot172; Pogie24; Redmax1 & Belfast Lass; Sask_girl & Novy; schnor; scratch1; & supersonic70. Companies who donated prizes are: Affinity Credit Union; Cache Advance; Cache At Night; CachingContainers; Cachers Corner Store; CoinsandPins.com; Geowyrm; Groundspeak; & Landsharkz. We would appreciate it if you could send a note saying thank you to show your appreciation. A huge Thank You to the Floral Community Association for the great deal on the school rental. If you would like to help in the planning & organizing for next year's SCAR event please let us know. Planning usually starts in the end of January or beginning of February. SCAR2012 was a huge success. More caches were published than ever before 518! More cachers than ever before took part - approximately 130 different geocachers with participants from Alberta, Ontario & all over Saskatchewan! Records were shattered during the event. A huge THANKS to Bennykidd for sharing their home with us!